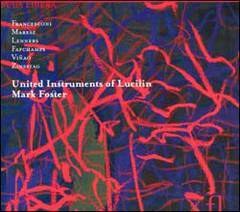 United Instruments of Lucilin : a future « European great » in the world of contemporary music ensembles. Born in 2000 with substantial help by the Ministery of Culture of the state of Luxemburg, the ensemble has already gained an impressive reputation, and this first recording explains why; six recent works of famous contemporary composers are presented here for the first time, and among them Lettre soufie : D, commissioned by Lucilin to the Belgian Jean-Luc Fafchamps. Francesconi, Maresz, Lenners, Viñao et Zinsttag accompany this very gifted young composer under the authoritative direction of a conductor who « fell in love » with Lucilin, and who does not need to be presented : Mark Foster.